Dubai, UAE, January 30, 2019: Under the guidance of His Highness Sheikh Dr. Sultan bin Mohammed Al Qasimi, member of the Supreme Council - Ruler of Sharjah, and under the patronage of His Highness Sheikh Sultan bin Mohammed bin Sultan Al Qasimi, deputy ruler of Sharjah, the H.H. Sharjah Ruler Cup International Show Jumping Championship (CSI5*W) begins today. The Sharjah Equestrian and Racing Club, in cooperation with the UAE Equestrian and Racing Federation (UAEERF) and under the supervision of the International Equestrian Federation (FEI), have organized the H.H. Sharjah Ruler Cup as a five-star ranked competition, the highest in international tournaments in the world of show jumping. The H.H. Sharjah Ruler Cup International Show Jumping Championship (CSI5*W) is sponsored by Longines, the Official Time Keeper and presenting partner of the Emirates Longines Show Jumping league competitions; the Sharjah Sports Council; the Sharjah Commerce and Tourism Development Authority; Al Shira’aa Stables, Sharjah Islamic Bank; the Sharjah Chamber of Commerce and Industry; Al Sakab Stables; Sharjah Equine Hospital; Sharjah Sports Channel; Cavalor and Sharjah University City. This is the second edition of the championship, with the first taking place in 2018, and it continues to be the first jumping event of its kind in the region and the Middle East in general, being held in the covered arena. The championship takes place over four days beginning from today and concluding on Saturday and is one of the qualifiers for the Show Jumping World Cup that will be held in Sweden in April. The three other qualifiers were organized in the UAE in the emirates of Al Ain, Abu Dhabi and Dubai respectively. Male and female riders from 42 countries will participate in the H.H. Sharjah Ruler Cup International Show Jumping Championship (CSI5*W) with an estimated 400 horses participating. 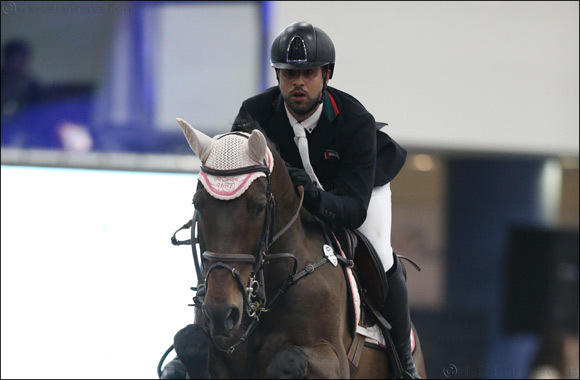 Riders will be competing for a purse worth 532,000 Euros – the equivalent of more than AED 2,300,000. The championship program consists of 28 rounds that will be held in both the covered arena and the outer field of the Sharjah Equestrian and Racing Club, including a seven round main event. The championship also consists of a CSI2* classes, as well as a young horses’ category for horses between 6-7 years old (CSIYH1*); a children’s category for 10–14-year-olds (CSIOCH); a young riders’ category for 15–18-year-olds (CSIOY); and a junior riders’ category for 18–21-year-olds (CSIOJ). Sheikh Abdullah bin Majid Al Qassimi, Chairman of the Sharjah Equestrian and Racing Club is presiding over the committee as the Honorary Chairman of the Organizing Committee with the event being presided over by Sheikh Sultan bin Ahmed Al Qasimi, Chairman of Sharjah Media Foundation and the Head of the Information Office of the Government of Sharjah. The championship is managed by Sultan Mohammed Khalifa Al Yahyai, General Manager of the Sharjah Equestrian and Racing Club, with the assistance of Ashraf Al Leithi, Deputy Director of the Sharjah Equestrian and Racing Club. The ground jury is led by Hussam Zummit, with assistance from nine other ground jury members and a representative from the International Equestrian Federation (FEI), Karim Badaro. International Dutch course designer, Louis Konickx, and the UAE’S Atef Shawki, designed the course with the help of seven other international course designers. Sweden’s Maria Hernek, and Chief Steward, Ali Mohajer, will supervise the courses with assistance from eleven international assistant stewards. The championship will also consist of a variety of non-equestrian events catering to the wider community and their families, including an equestrian exhibition with the latest in equine equipment and apparel, a heritage village, a kids’ corner with children’s games, free pony rides, as well as various restaurants that cater to all tastes, and other entertainment programs.